Living Wills and Advance Directives are legal documents providing instructions for your care if you are medically incapable of making the decisions for yourself. It can indicate that you don't want extreme measures taken or the extent of measures you would like taken if you are incapacitated. Having a Living Will and Advance Directive will take the burden off family members who may be confused or who may disagree with each other about your treatment in a very stressful time. Having one gives you peace of mind that your wishes will be followed at a time when you will be unable to convey those wishes to the appropriate individuals. 1) Palliative care - Do you wish to die at home? Do you want pain medications administered? How many invasive tests or treatments will you allow? 2) Antibiotics and Antivirals - How aggressive do you want to be treated with either? If you are near the end, do you want these drugs or do you want any infection to run it's course? 3) Resuscitation - Do you want CPR given or withheld? What about the use of a defibrillator? 4) Ventilation - Do you want to be placed on a ventilator that breathes for you? If so, for how long? 5) Feeding Tube - Yes or no? If yes, for how long? 6) Organ and tissue donation - Are you planning to be a donor? Do you have preferences about what organs are used and what are not? 7) Body donation - If you would like to donate your body it is helpful to register ahead of time with a medical school or donation program. Along with the Living Will and Advance Directive you should also have a Health Care Power of Attorney. Issues can arise that you haven't covered in the Living Will and Advance Directive. A healthcare power of attorney would be a person you appoint to be in charge of those unforseen medical decisions. You should appoint someone you trust and someone you know will advocate for your wishes to be followed. An alternate is also recommended in case the primary is unavailable or unwilling to fulfill the role. 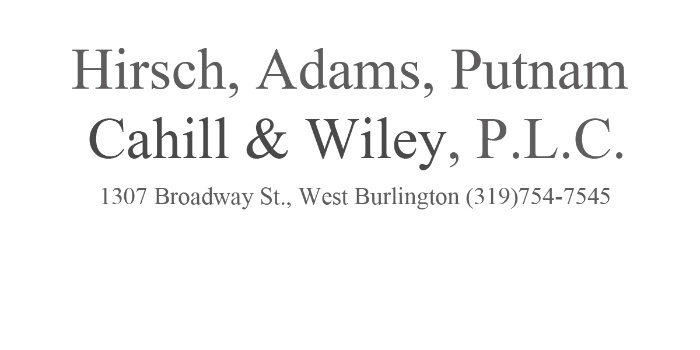 Mr. Wiley and Mr. Cahill use a combined Declaration Relating to Life Sustaining Procedures (Living Will) and Durable Power of Attorney for Health Care Decisions (Medical Power of Attorney) where you can address all of the above.